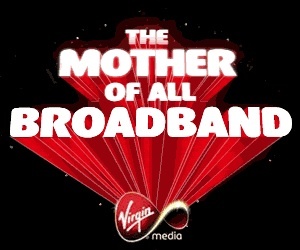 Virgin Media is to set to offer its customers broadband speeds of up to 400Mbps (thats megabits per second to you and I) in the near future with 100Mbps lines becoming available by the end of the year. According to the BBC, Virgin Media are said to be readying 400Mbps-ready modems and routers capable of handling and delivering super-fast internet to its customers where data transfers are so fast an album can be downloaded in under a second and an HD movie coming down the pipe in under two minutes. The increase in internet speed will enable its customers to move their data and media to the cloud, with the company looking to introduce internet based storage and content delivery ensuring customers would no longer have to worry about the physical capabilities of their computer instead storing photos, films and documents entirely online. Virgin Media expects demand for faster broadband will grow with the increase in online gaming and businesses allowing employees to work from home. I have an account with Virgin Media and enjoy 20Mbps download speed, I can’t fathom how fast 400Mbps would be.